My mother and me last November in the Palama Settlement Archives. She spent 15 years creating this valuable source of history for the Settlement, where my father was born. Today marks my mother, Jacky Rath’s, 90th birthday. She is in amazing health and is still a true intellectual who has all her faculties intact. Believe me, she beats everyone in the family at Scrabble and Gin Rummy. She reads the Economist, the New York Times and The New Yorker and countless biographies, histories and novels. A former archivist, books are an important part of her life. In spite of macular degeneration, she is still able to read, albeit with a magnifier. Her 90th causes me to pause and think about how the world around her has changed since she was born in 1921. Here are just a few thoughts from the personal history she has shared with the family. Jacky Rath was born Jacqueline Lee Jacobs on February 25, 1921, in California. She was the eldest daughter of James Paul Jacobs and Helen Lee Jacobs. Her father was an Army officer so she and her mother, sister and brother moved around a great deal, from West Coast to East Coast and back again. She had to adapt to a new school, and make new friends, every two or three years. She thrived on it. Later, when I was at Punahou, she always told me to be especailly nice to the military kids because they had to move around so much and constantly make new friends. Mother remembers living in Waikiki in the 1920s when it was a small, close-knit neighborhood. Her father was stationed at Ft. DeRussey, his favorite post and one to which he would return whenever possible. Her little brother, Jim, just a toddler, would wander out of the house and down to the beach. Neighbors would bring him home again, all sandy and wet. Imagine Waikiki being that safe! Mother attended Jefferson School, Roosevelt and Punahou. Her practical father was stressed about having two daughters (Carol was just two years younger than Jacky) in college at the same time so he had Mother, who was a brilliant student, skip two grades in high school. She graduated at the age of 15. During her 16th year he took her for “The Grand Tour” of Europe for four months. It is one of her fondest memories. Entering U.H. at 16, she looked at least five years older than she was. (She was 5-feet-8 at age 11.) Beautiful and poised, she met my father, Robert Helsher “Bobby” Rath at a U.H. beach party. He was 21 and already working, as it was the Great Depression and he could not turn down a job at Union Oil Company. He had no idea she was only 16. Daddy’s idea of a hot date was when he would go body surfing at Sandy’s and Mother would sit on the beach and watch him. She says she loved it. A cute dating story: Daddy asked Mother what her favorite flower was and she replied: daisies. He wanted to impress her, and her parents, and he didn’t think daisies would impress much so he bought her 12 dozen daisies! After a year at U.H. she went off to Goucher College, in Baltimore, Md., which is also my alma mater. While at Goucher, she was featured in a photo in Life magazine as a college trend setter. She was wearing a kilt she had bought in Scotland. Daddy waited for her for three years and when she returned home in 1940, they were married that summer. They were married for 66 years when Daddy died in 2006. He adored her and put her on a pedestal. I remember he used to sing all the old ’30s and ’40s songs (such as “Sweet Someone”) to her in his lovely falsetto. They were famous in Honolulu circles as beautiful ballroom dancing partners and champion paddle tennis players. On December 7, 1941, Mother was in their little cottage in Manoa. Daddy was driving down to the Union Oil refinery when the Japanese bombed Pearl Harbor. She was alone in Manoa for three days while Daddy helped fight the fires and keep his refinery safe. All through the war, no one in Honolulu was allowed to be out at night or have lights on or parties after dark. Curfew was strictly enforced. Mother said they used to go to blackout parties at the Halekulani. Mother and Daddy built the first home on Farmer’s Road in Kahala, among the vegetable and pig farms. After my brother was born they sold that house and built a home on Portlock Road. During that time my father traveled constantly and Mother pretty much raised us three kids as a single mother. Picture this in the late ’40s and early ’50s: Hawaii Kai did not exist; it was just pig farms and cherry tomato patches. Portlock Road was an isolated road and the nearest market was Foodland Aina Haina. In 1953, Union Oil moved our family all over the West Coast, to the Bay Area, Seattle and L.A. Mother managed all the moves, as Daddy would go ahead of us for work. In 1966 Union Oil asked my father to become president of Unoco Oil (not bad for a guy who started as an office boy) in Hong Kong. Mother, Daddy and my sister Berta all moved to Hong Kong. I was in college and my brother was in Vietnam. Mother was the consummate corporate wife throughout their four years there, playing mahjong with the other wives, doing volunteer work reading to the blind, keeping the home front while Daddy traveled at least nine months of the year. 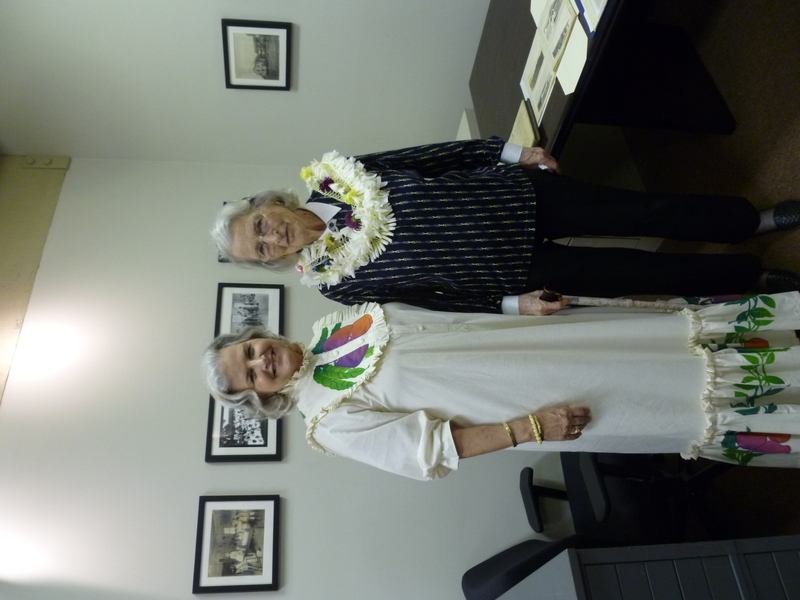 Mother worked as an archivist in the Punahou library and created the Hawaiiana Room in Cooke Library. She is respected for both her intellect and her beauty. Now at 90, she enters a new era with the same grace she has entered each era of her life. I could not be more proud of my mother. This entry was posted in StylePhile. Bookmark the permalink. What a milestone, happy birthday mamma!